And to start 2018 off right, we have a great line up of new cozy releases. For country-store owner Robbie Jordan, the Maple Syrup Festival is a sweet escape from late-winter in South Lick, Indiana—until murder saps the life out of the celebration. 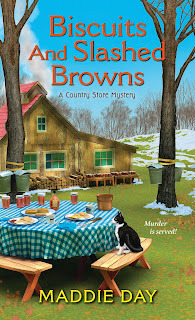 Robbie drops her maple-curry biscuits to crack the case before another victim is caught in a sticky and murderous trap. Yoga instructor Kate Davidson is ready to marry her boyfriend Michael, so she's disappointed when a special dinner doesn't end with a proposal. But disappointment turns to dismay and outrage as she learns the real problem: Michael is already married and his estranged wife is blackmailing him. When his wife's body is found―by Kate and her dog, no less―Michael is strangely unable to remember where he was the night she died. Since Michael has no alibi, Kate steps up to uncover what happened. What she walks into is a tangled web of deceit, obsession, and immigration fraud . . . with Michael trapped in the middle. 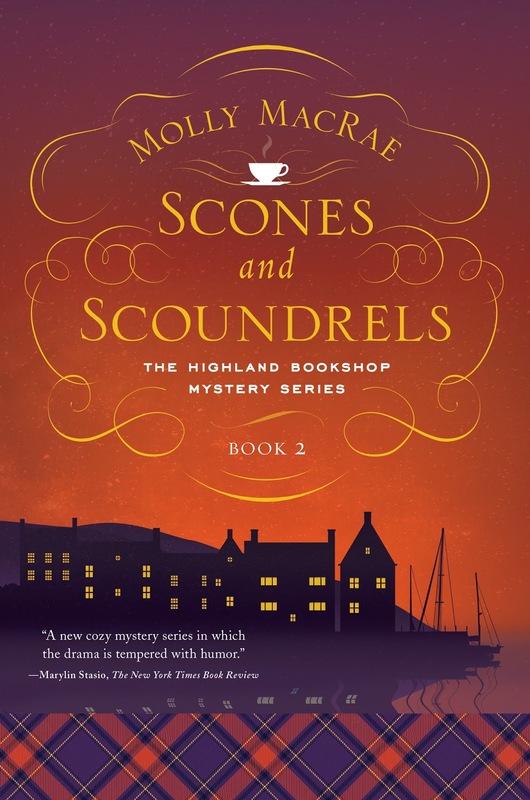 The new mystery in the Highland Bookshop series, bringing together a body outside a pub, a visiting author determined to find the killer, and a murderously good batch of scones . . .
Inversgail, on the west coast of the Scottish Highlands, welcomes home native daughter and best-selling environmental writer Daphne Wood. Janet Marsh and her business partners at Yon Bonnie Books are looking forward to hosting a gala book signing for her. Daphne, who hasn’t set foot in Scotland in thirty years, is . . . eccentric. She lives in the Canadian wilderness, in a cabin she built herself, with only her dog for a companion, and her people skills have developed a few rough-hewn edges. She and the dog (which she insists on bringing with her) cause problems for the school, the library, and the bookshop even before they get to Inversgail. Then, on the misty night they arrive, a young man who’d spent a night in the B&B above Yon Bonnie Books is found dead outside a pub. Daphne did her Inversgail homework and knows that Janet and her partners solved a previous murder. She tries to persuade them to join her in uncovering the killer and the truth. To prove she’s capable, she starts poking and prying. 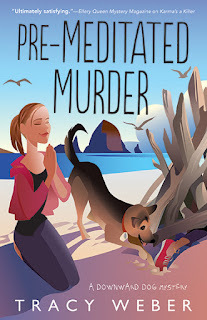 But investigating crimes can be murder, and Daphne ends up dead. Was she poisoned by scones from the tearoom at Yon Bonnie Books? To save the reputation of their business―not to mention the reputation of their scones―Janet and her partners must solve both murders. And Daphne’s dog might be able to help them, if only they can get it to stop howling . . .
Pub owner Maura Donovan hasn’t seen her mother for over twenty years, so when she suddenly shows up in Maura’s pub, Maura’s not sure what to expect. Her mother is trying to find a life for herself back home and has taken up a position working with the new owners of the Crann Mor hotel just outside Skibbereen. Until her new boss is found dead in the gardens, dumped down the hillside behind the hotel. Now, trying to rekindle the relationship they’ve lost, Maura must investigate in order to clear her mother’s name. 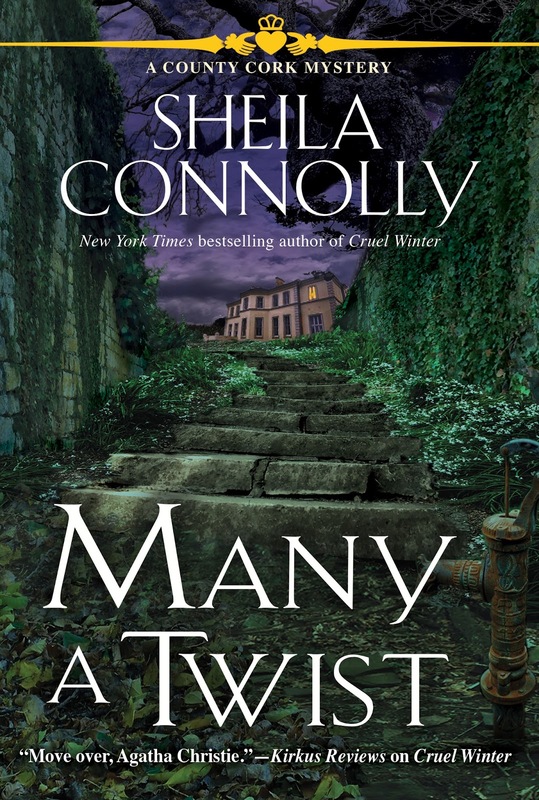 It’s not so easy though, as long-time residents of County Cork, including the families of her employee Mick, and the family of the deceased hotel owner, have bottled deep dark family secrets not meant to be uncorked. And someone will kill to keep them that way. How far would you go to protect your family? 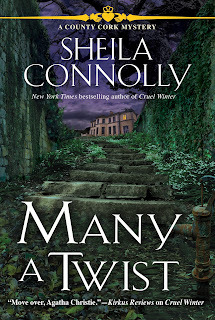 Maura tests the age-old question in Many a Twist, the charming and atmospheric sixth County Cork mystery from New York Times bestselling author Sheila Connolly. Emily Westhill runs the best donut shop in Fallingbrook, Wisconsin, alongside her retired police chief father-in-law and her tabby Deputy Donut. 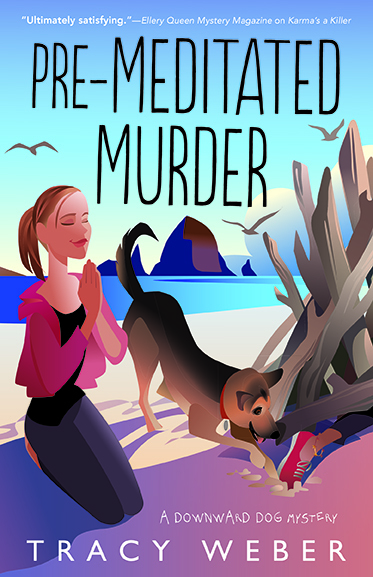 But after murder claims a favorite customer, Emily can’t rely on a sidekick to solve the crime—or stay alive. If Emily has learned anything from her past as a 911 operator, it’s to stay calm during stressful situations. But that’s a tall order when one of her regulars, Georgia Treetor, goes missing. Georgia never skips morning cappuccinos with her knitting circle. Her pals fear the worst—especially Lois, a close friend who recently moved to town. As evening creeps in, Emily and the ladies search for Georgia at home. And they find her—murdered among a scattering of stale donuts . . .
Disturbingly, Georgia’s demise coincides with the five-year anniversary of her son’s murder, a case Emily’s late detective husband failed to solve before his own sudden death. With Lois hiding secrets and an innocent man’s life at stake, Emily’s forced to revisit painful memories on her quest for answers. Though someone’s alibi is full of holes, only a sprinkling of clues have been left behind. 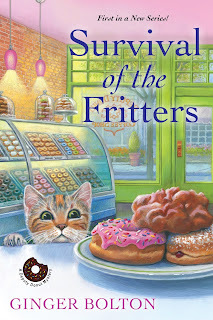 And if Emily can’t trace them back to a killer in time, her donut shop will end up permanently closed for business . . .
Oh my January just became my favorite month! Wonderful! Looks like I have a brand new series for the brand new year. 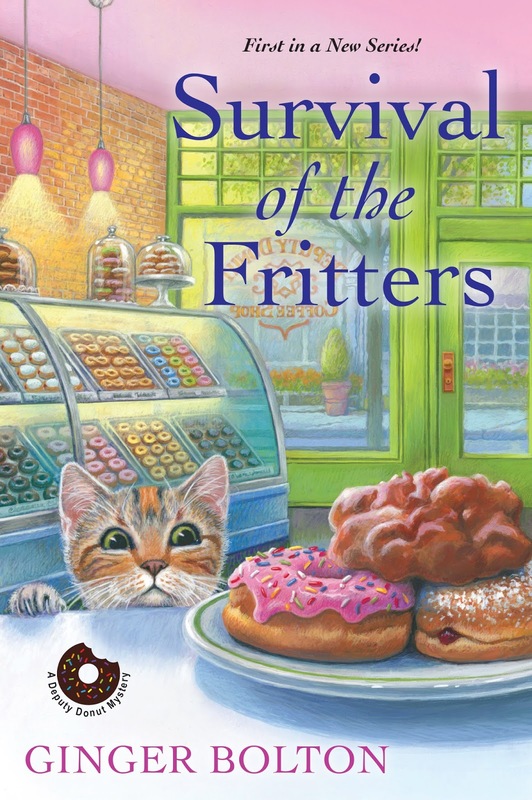 Ginger, "Fritters" sounds like a great read! New reads and continued series! Happy birthday month to me! So many great books to look forward to this month. I'm really looking forward to Tracy's new book. They look awesome! Happy reading in 2018! I can’t keep up! I do have the Scones and Scoundrels on reserve at the library. Just finishing the first in that series. Fun reading for folks who are “colder-in.” Thanks!